"Comes in pre-measured packets…one of the easiest and most popular ways to ensure that your dog is getting a daily dose of probiotics." "This powder formula is actually safe for use in both dogs and cats, which offers additional savings and convenience to multi-pet households." "The best part about this probiotic chew for dogs is how fast it works." "Adds pumpkin to support the overall function of the digestive tract and papaya to assist the stomach in breaking down fats and proteins." "It omits many of the most common allergens, including wheat, corn, soy, egg, gluten and more – but includes…glucosamine to ease any arthritis." "Beneficial bacteria can help…relieve an upset tummy due to diet changes or unsupervised snacking (since puppies have a tendency to get into things!)." "Specific ingredients…include EpiCor – a supplement blend of antioxidants, fiber, protein, and vitamins to help support the immune system." "Easy to dispense while supplying beneficial bacteria for your pet." Purina Fortiflora Canine Nutritional Supplement comes in pre-measured packets and is one of the easiest and most popular ways to ensure that your dog is getting a daily dose of probiotics, which is why it's our top pick. No matter what your reason is for adding a probiotic to your dog’s diet, there is a pretty good chance that one of the thousands of happy pet owners using this product have overcome the same challenge. Problems such as doggy diarrhea, gas, or tear stains have all been greatly improved with the use of this supplement. It’s as easy as opening a packet and sprinkling it over your dog’s food at mealtime. And your dog isn’t likely to complain about the taste—in fact, many people state that their dogs lick the bowl clean to get every last bit of this probiotic powder. 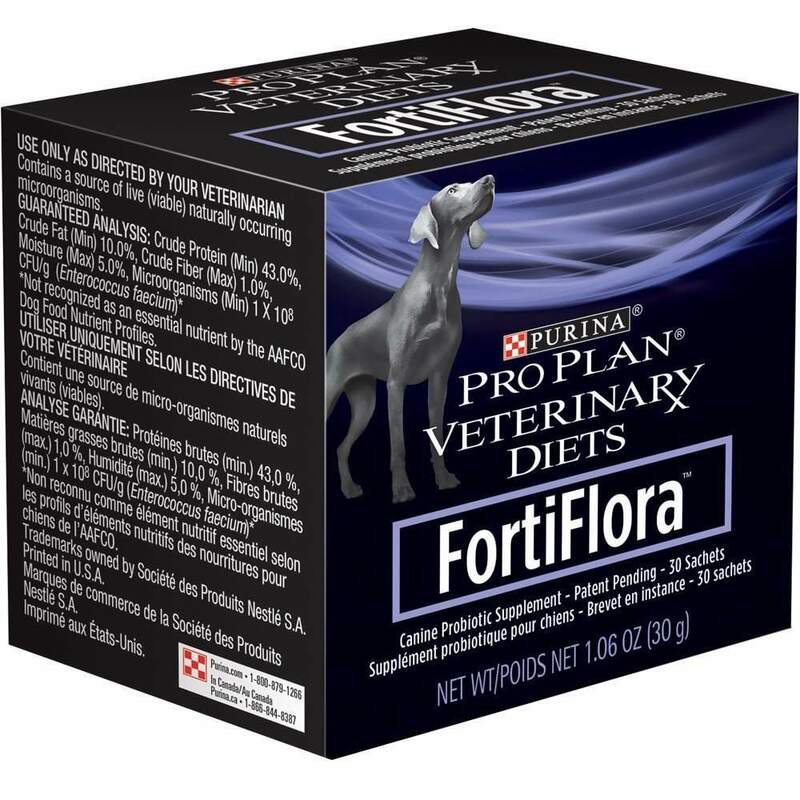 For about $30 you’ll get 30 packets of Purina Fortiflora, which is usually a month’s supply. This is a slightly above average price for a monthly supply of dog probiotics, but the track record of this product often justifies spending the extra few dollars. Some people stretch the box further by using half of a packet a day as maintenance—once their pup’s gut is back on track. If you’re shopping around for a budget-friendly pet probiotic, keep an eye on quality but skip individual packaging. Nusentia Probiotic Miracle Powder is our top pick for an affordable probiotic for dogs. This powder formula is actually safe for use in both dogs and cats, which offers additional savings and convenience to multi-pet households. It’s also shelf-stable, so you don’t have to clear room in the fridge or worry about it spoiling in the pantry. There are 6 strains of probiotics in this formula, and each scoop will deliver about 1 billion CFU. This may not be as many CFU per dose as some other products, but the results indicate that this product is still highly effective. Each container holds up to 360 servings, depending on the size of your pet. For dogs under 50 pounds, give 1 scoop. Dogs over 50 pounds get 2 scoops. This means that each jar of Nusentia Probiotic Miracle Powder will last anywhere from 6 months to a year, on average. For less than $50 a year, your pet can experience relief from tummy troubles, gas, and other digestive distress. And while this may be a cheap probiotic powder for dogs, the product is made in the United States with no Chinese-sourced ingredients. The quality and quantity of Nusentia Probiotic Miracle Powder combine to make this a great choice for an affordable probiotic for pets. Many dog probiotics are available as a chew, which in your dog’s mind is practically the same as a treat! Give your dog healthy probiotics and a reason to wag his tail with the PetVitalityPro Probiotic Chew. This duck-flavored soft chew has over 20 active ingredients and includes a green superfood formula – so fair warning: it has a green-ish tint. A few pet parents said they were surprised by the color when they opened the container. Most dogs will gladly gobble this probiotic chew whole, but if for some reason your dog isn’t interested in an extra ‘treat,’ then these chews crumble easily and can be mixed in with a meal. The best part about this probiotic chew for dogs is how fast it works for many pets. In cases of persistent itchiness or worrisome diarrhea, pet owners have noticed that their dogs experienced fast relief once they began a regiment that included PetVitalityPro Probiotic Chews. In fact, one pet parent pointed out that these worked more effectively than any other natural or medicinal approach she tried for her dog’s digestive distress. Turn treat time into an opportunity to give your dog a daily dose of good bacteria with these tasty PetVitalityPro Probiotic Chews for dogs. If your dog is experiencing digestive distress or frequent tummy trouble, a probiotic with digestive enzymes may help to ease digestion and regulate elimination. Zesty Paws Probiotic Bites are a top choice and an all-natural supplement that works well for dogs large and small. Each probiotic bite from Zesty Paws has 6 strains of probiotics and prebiotics and over 3 billion CFU, which is equivalent to some prescription-strength probiotics. This probiotic supplement for dogs adds pumpkin to support the overall function of the digestive tract and papaya to assist the stomach in breaking down fats and proteins. Together, these two additives make it easier for many dogs to properly digest and eliminate food. Reviews are mixed on whether the taste is a winner – some dogs gobble these chews up while others are more selective. In certain cases, pet parents had success getting even picky pets to eat the chew by crumbling it into their meal. In addition to assisting with digestion and elimination, this probiotic supplement has also helped many dogs that were lacking an appetite or had extreme lethargy. As your dog ages, new problems may begin to pop up. Tackle any developing digestive dilemmas and ease joint pain with a probiotic for senior dogs, like Amazing Nutritionals Probiotics Joint Formula. This tablet has helped many older dogs that suffer from arthritis, joint pain, and stiffness. It omits many of the most common allergens for dogs, including wheat, corn, soy, egg, gluten and more – but includes 7 billion CFU of beneficial bacteria. In addition, your dog will get a dose of MSM, chondroitin, and glucosamine to ease any arthritis and support joint and cartilage health. People find that this supplement is a great choice for their senior dog and is an easy way to help them feel more comfortable and get around easier. Some dogs have been able to replace additional joint supplements with this single pill, but this varies for each dog. Either way, these probiotics for senior dogs are a great choice for supporting digestive health and mobility into the golden years and beyond. The puppy phase is a crucial stage of development, and as pet owners we want to give our dogs the best start in life that we can. Support a healthy gut from an early age by introducing an easy-to-digest probiotic for puppies, like Pro Bloom Instant Goat’s Milk & Probiotic Supplement from The Honest Kitchen. Each serving contains an impressive 5 billion CFU of healthy bacteria. This beneficial bacteria can help your puppy improve digestion, ease elimination, strengthen the immune system and also relieve an upset tummy due to diet changes or unsupervised snacking (since puppies have a tendency to get into things!). People love how easy it is to give this supplement to their pups. Just add water to the human-grade instant goat’s milk and you have a ready-to-serve puppy probiotic treat. You can also pour the milk concentrate onto dry or dehydrated dog food before serving. While it isn’t mother’s milk, this probiotic for puppies is a healthy, nourishing way to support healthy growth and development. And even though it’s a great idea for helping puppies get the probiotics they need, it’s suitable for dogs of all ages. 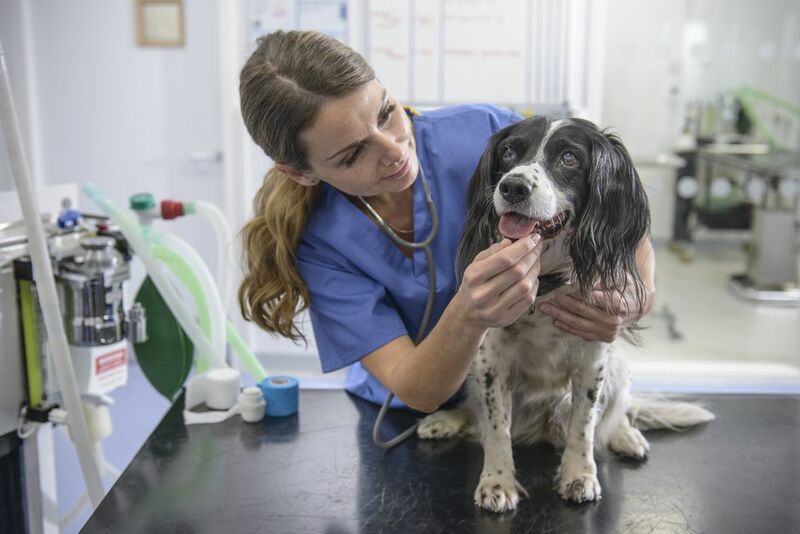 A surprising amount of allergy issues can be connected to gut imbalances, so it makes sense to help your pet have a healthy gut. The Allergy Immune Bites from Zesty Paws combine a robust blend of probiotics with a blend of supplements to promote both gut and immune health. The Allergy Immune Bites contain both prebiotics and probiotics to help boost doggy digestion and support wellness through balanced gut bacteria. The blend contains both prebiotics and probiotics, and each chew contains 250 million CFU from 5 strains. This is not the most potent probiotic for dogs on our list and may not be a great choice if this is your only criteria in choosing a supplement. But if your pet also has allergy issues, then keep reading to see how this probiotic for allergies may help. Specific ingredients to help your pet with allergy issues include EpiCor – a supplement blend of antioxidants, fiber, protein, and vitamins to help support the immune system. In addition, Omega-3 rich wild Alaskan salmon oil is blended into the formula to help remedy itchy skin. Pets with both food allergies and seasonal allergies have responded well by adding this probiotic and allergy support supplement to their diet. Some pet owners state that it took several weeks to notice a difference once they began giving this supplement to their dogs, but stick with it and you’ll have a healthier, happier, less itchy pet! If you’re looking for the simplest way to give your dog a daily dose of probiotics, a spray formula is hard to beat for convenience. The FloraZil+ Multi-Probiotic Food Spray is our choice for a probiotic spray that is easy to dispense while supplying beneficial bacteria for your pet. This probiotic spray for dogs doesn’t need to be refrigerated, so store it in the place that is most convenient for you. Each milliliter of the liquid formula contains a minimum of 750,000 CFU of probiotics. The number of sprays in a single dose of the formula depends on the size of your dog, with smaller canines getting up to 3 sprays at a time and larger dogs getting anywhere from 4-6 sprays per meal. Pet parents are quick to point out that this formula is commonly recommended by veterinarians, and that it’s easy to spray it on food before mealtime. Most pets seem to like the taste – and some wait for it before digging into their dinner. If measuring or mixing a supplement into your dog’s meal isn’t compatible with your daily routine, then FloraZil+ Probiotic Spray for dogs is a simple solution to support your dog’s gut while keeping things easy. Our writers spent 3 hours researching the most popular probiotics for dogs on the market. Before making their final recommendations, they considered 11 different probiotics overall, screened options from 10 different brands and manufacturers and read over 160 user reviews (both positive and negative). All of this research adds up to recommendations you can trust.